I am so amazed and thankful for our grandkids attitudes about work. For the most part they love to help. They were always eager to help when they were very young, but have actually gotten to the stage where they are actually a big help, but trust me in didn’t start that way. You do have to let toddlers help when they want to or when they are old enough to really help they won’t want to. Now they all love to help with Alabu , boxing soap is their speciality right now. In the barn they will help clean the paddock, collect eggs and they love to groom Caddy or give him a bath. In the garden, they plant, mulch, weed and harvest. They all want to help with whatever they find us busy doing. They are pretty good at sticking to the task until it is finished. Although sometimes they get distracted by worms, bugs, snakes, cats and dogs, but that is a good thing too. 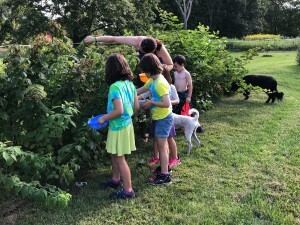 I try to keep reminding myself when I’m trying to get a chore done :o) I’m so thankful that our grandkids are learning to be responsible adults, exploring their world with love and curiosity. Posted by Maryclaire Mayes on Tuesday, September 25th, 2018 at 14:20 and is filed under General.